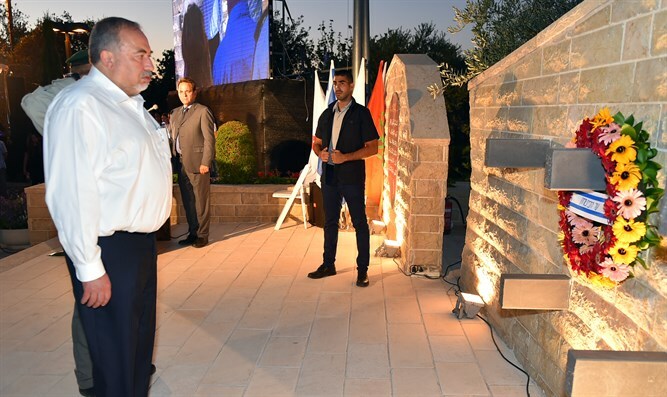 Defense Minister Avigdor Liberman took part in the Brit Achim event, the annual ceremony for the Bedouin soldiers, and delivered a clear message to the terrorist organizations operating in the northern theater. Liberman referred to the threat made by the Syrian Deputy Foreign Minister, saying that "Israel will pay a heavy price" following last week's attack in Syria, according to foreign reports. "We all hope that one day the Middle East will become a region of peace, cooperation, and co-existence, but unfortunately, today we heard threats coming from our northern border, and I mean the words of the Syrian Deputy Foreign Minister who once again slandered and cursed the State of Israel." He stressed, "I strongly suggest to our neighbors from the north not to try us or send threats, because we take all threats seriously. And I do not suggest that they test us, and I do not advise them to enter into a confrontation with the State of Israel. Because for them it will end badly, very badly." FM Liberman said that the contribution of the Bedouin conscripts to the IDF and to the security of the state is great indeed: "Every day they assist in thwarting terrorist attacks in Israel, and they have unique and very significant capabilities." According to the Defense Minister, there are Bedouin families who wish not to publicize the names of their fallen loved ones, out of fear of boycott or ostracism. "We are aware that conscripts, who have decided in a courageous civic step to tie their lives to the IDF and Israeli society as a whole, often face complex dilemmas, and it is clear to us that various events influence the desire to integrate or to close off. We take note of this and act to create an understanding of the unity of destiny and to pave paths of life of mutual respect and cooperation. "Of course, this also needs an openness, which is still required of the Israeli society, to accept the minority and the other, with the understanding that 'we are all one human tissue. All of us'," Liberman said.